Pylephlebitis Following Infected Choledocholithiasis, Endoscopic Retrograde Cholangiopancreatography and Cholecystecomy. 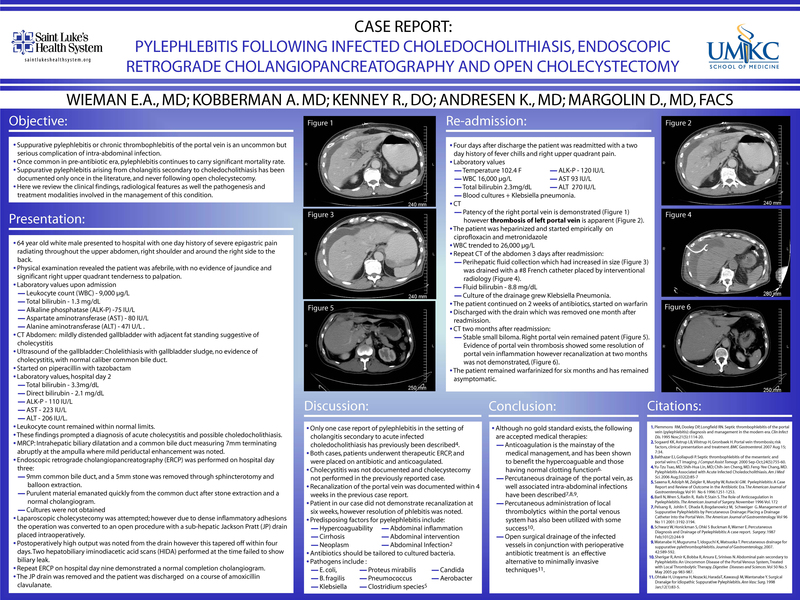 PYELPHLEBITIS FOLLOWING INFECTED CHOLEDOCHOLITIASIS ENDOSCOPIC RETROGRADE CHOLANGIOPANCREATOGRAPHY AND OPEN CHOLECYSTECTOMY. WIEMAN E.A., MD; KOBBERMAN A., MD; KENNEY R., MD: ANDRESEN K., MD; MARGOLIN D., MD. UMKC Department of Surgery, Saint-Lukes Hospital, Kansas City. Suppurative pylephlebitis or chronic thrombophlebitis of the portal vein is an uncommon but serious complication of intra-abdominal infection. Once common in the pre-antibiotic era, pylephlebitis continues to carry a significant mortality rate. To our knowledge cholangitis secondary to choledocholithiasis has been documented only once in the literature, and never following ERCP or open cholecystecomy. This article reviews the clinical findings, radiological features as well the pathogenesis and treatment modalities involved in the management of this distinctive infectious phenomenon. This report focuses on the case of a 64 year old man presenting with acute cholangitis secondary to choledocholithiasis. The patient underwent endoscopic extraction of biliary stones and sphincterotomy. Subsequently laparoscopic cholecystectomy was attempted. This was converted to open procedure as a result of severe inflammation of the gallbladder. A small but persistent bile leak was drained percutaneously by interventional radiology. The output from that drain tapered quickly and it was removed shortly before his discharge. He returned shortly four days later complaining of fever, and abdominal pain and was found to have Klebsiella pneumonia bacteremia. CT demonstrated thrombosis of the left portal vein and its branches. Repeat CT scan two days later revealed a persistent bile leak. Percutaneous drainage of the biliary leak was performed and cultures from that fluid tested positive for Klebsiella pneumonia. On discharge the patient was placed on a regimen of antibiotics and anticoagulation. Follow up CT after six weeks showed a degree of resolution of phlebitic inflammation; however no recanalization of the thrombosed aspect of portal vein was noted at that time. A high degree of clinical suspicion and early CT imaging are imperative in making an early diagnosis of what is both a rare and insidious disease process. This case is unique in that the infection occurred in the delayed post-operative setting for treatment of infected choledocholithiasis. Since pylephlebitis is such an uncommon process the utilization of separate therapies, remains a difficult task in optimizing outcome. Diverse treatment mechanisms have been described including antibiotic therapy, anticoagulation, and percutaneous drainage of the portal venous system. However, limited information exists regarding these the use of these treatments, alone or in combination. Therefore pylephlebitis as illustrated in this report requires keen instinct and proper radiological imaging to make an early diagnosis, but continues to present a therapeutic challenge in modern medical practice.